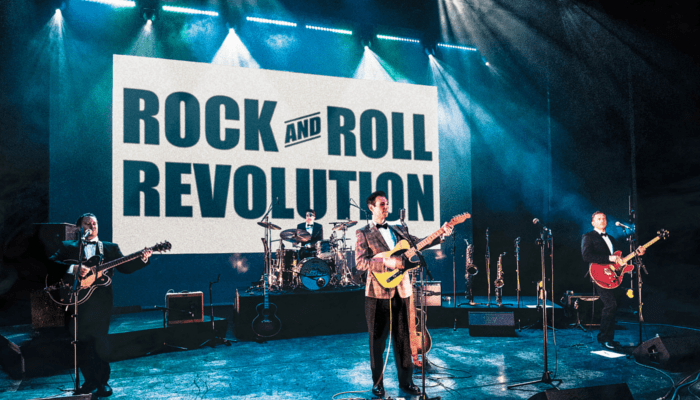 The Bluejays, the UK’s leading vintage Rock ‘n’ Roll band present Rock and Roll Revolution – a major new live music theatre tour celebrating the 1950s. The show tours to more across the UK throughout 2019. The Bluejays formed in 2013 and very quickly became one of the UK’s busiest vintage live acts. First up was a Friday night residency at London’s celebrated but sweaty Troubadour Club. Live videos posted to YouTube sparked interest in the band both nationally and worldwide and generated a loyal and evergrowing social media following. Since then, the band have played all over the world in theatre and at festivals and private events. Rock and Roll Revolution premiered in London in April 2017. The show is written and produced by The Bluejays and features more than 40 of the biggest hits of the 1950s performed live onstage. After sold out shows in Essex, Staffordshire and Yorkshire the band are really excited to be touring their show across the UK. For more information, please see the official website. If you’re looking for more vintage flavoured shows, be sure to check out our NEWS section for more info.